Natural facial expressions like smiling, laughing and pondering all involve muscle contractions, and in your 20s you might start to see some fine lines and creases related to facial movement—first around the brow and then in the form of "crow's feet" around the eyes. You may also see lines around the eyes if you spent a lot of time in the sun as a child, or if you squint at a computer screen for long hours. As you age; your skin's collagen and elastin—which are proteins that keep your skin tight—break down faster than your body can rebuild them. As a result, your skin in your 30s may start to look tired and less radiant. As your skin loses elasticity, you may develop more noticeable wrinkles and lines. 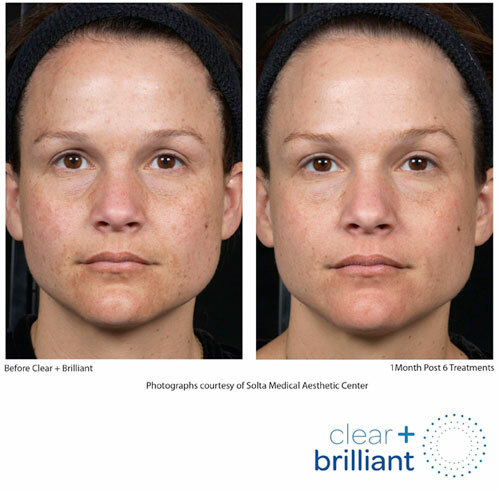 In addition, you may start to notice brown spots or uneven pigmentation caused by sun exposure. Your skin may start to appear less smooth or glowing. Lines may form around your eyes, mouth and forehead; your lips may get smaller; some skin may start to sag; and the corners of your mouth may turn down—so you look like you're frowning when you're not. At this age, the breakdown of collagen and elastin that started in your 30s is now in full force, causing your skin to sag. Your skin may also start to look thinner and more translucent, which can make blood vessels more visible—causing your skin to look discolored. Your skin may get dryer, lines may appear on your cheeks, lines from your nose to your mouth may become deeper, and expression lines may also become more pronounced. You may see more age spots/sunspots, especially if you are fair-skinned. The good news is that adding Clear + Brilliant to your bag of tricks at any age will not only prevent signs of aging but also will help you recover the glow, luminosity and smoothness your skin, and you, deserve.